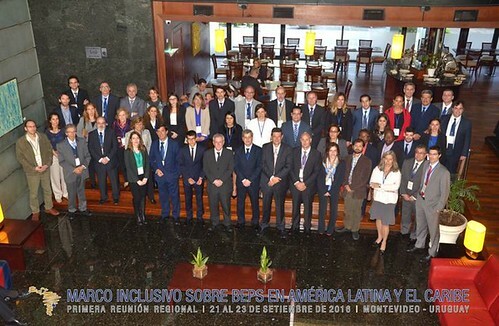 23/09/2016 - 57 delegates from 10 countries and 8 organisations gathered in Montevideo for the 1st regional meeting of the Inclusive Framework on Base Erosion and Profit shifting (BEPS) after its launch in Kyoto on 29 June-1st July 2016. This meeting was the first of a new series of events that will offer participants from different regions in the world the opportunity to feed their views and provide their input into the Inclusive Framework on BEPS. This meeting allowed participants to discuss the latest developments on the implementation work on BEPS, in light of the debates taking place in the Committee on Fiscal Affairs' Working Parties. Participants were also updated on the progress of the work on the toolkits aimed at addressing the specific needs of developing countries in implementing the BEPS measures. These discussions provided the ideal framework to obtain input into the work and on the priorities of the participating countries and their needs in relation to capacity building and training. The event was hosted by the Ministry of Economy and Finance of Uruguay, and organised by the OECD in partnership with the World Bank Group, the Inter-American Development Bank and the CIAT. Participants included senior officials from Ministries of Finance and Tax Administrations from Argentina, Brazil, Dominican Republic, Ecuador, El Salvador, Honduras, Jamaica, Panama, Paraguay, Uruguay, as well as business representatives (BIAC and affiliated companies) and members from civil society, BMG, Latindadd, Oxfam, Tax Justice Network. Opened by Pablo Ferreri, Undersecretary of Economy and Finance of Uruguay, the meeting was co-chaired by Marcio Verdi, Executive Secretary of the CIAT and Fernando Serra Semiglia, Director of the Tax Advisory Department at the Ministry of Economy and Finance of Uruguay. For the latest news, please visit the BEPS website. For more information, please send an e-mail to ctp.communications@oecd.org.